Into its 9th year, Hwa Chong Past vs Present was started in 2008 to provide past and Hwa Chong Institution and Hwa Chong International School students a platform to gather and engage in friendly sports competitions with students of their age and also with alumni. Since last year, we have welcomed students and alumni of Nanyang Girls’ High School to join the event as well. 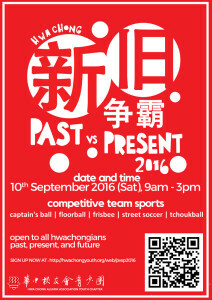 PvsP will be held on 10th September (Saturday) morning at Hwa Chong Institution. Form your teams and sign up at http://hwachongyouth.org/web/pvsp2016/ before 6 September 2016.